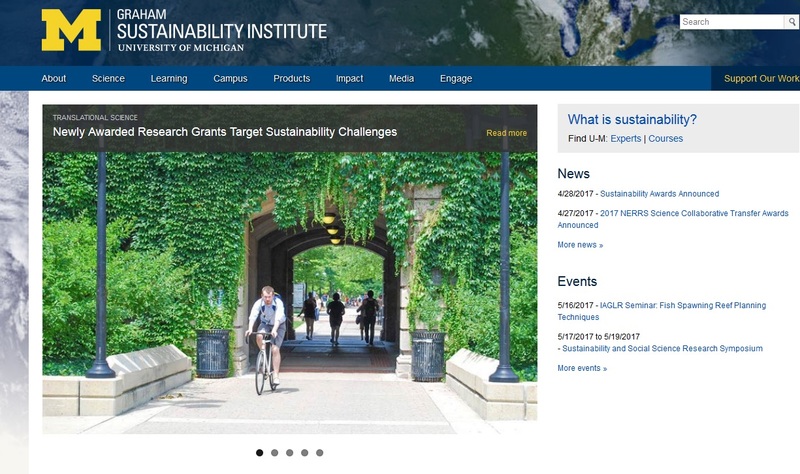 ANN ARBOR — The Graham Sustainability Institute at the University of Michigan has awarded $220,000 to support three sustainability-related research projects in Puerto Rico and Michigan. The projects vary in scale and address a range of sustainability issues, including energy and food system resilience in Puerto Rico, stormwater management on tribal lands in Michigan, and plans for a green energy village in Detroit’s Eastern Market. “These projects exemplify the best approaches for advancing sustainability — implementing innovative approaches, building community capacity and developing strong partnerships for future work,” said Drew Horning, interim director of the institute. Energy and agriculture were severely affected when Hurricane Maria devastated Puerto Rico in 2017. To build resilience and sustainability, this team of researchers from Michigan and Puerto Rico will work with community partners to implement a system that couples food waste, gasification, energy production and enhanced agricultural production. The project will include the design and establishment of four hybrid solar-biomass gasification micro-grid systems, and research on the sustainability of the system and the potential impact of its residues on the soil, as well as workshops to train community members on the construction of gasifiers. Researchers hope the project’s results will be replicable in other communities on the island and the Caribbean. Students from UM and universities in Puerto Rico will join forces with local agricultural and ecological nonprofits Casa Pueblo and Organización Boricuá to unite the food and energy sectors in Adjuntas, a small mountainside town 75 miles from San Juan. Adjuntas spent more than five months without electricity after Hurricane María hit Puerto Rico last September. “The town itself has energy now, but many surrounding areas are still without electricity. It is not clear whether they will able to get back on the grid,” said Ivette Perfecto, professor of environment and sustainability, who’s leading the project. The project will build on the work already done by Casa Pueblo, an organization of agroecological farmers with a long history of sustainable efforts in Puerto Rico. Other collaborators on the project include Jose Alfaro, clinical assistant professor of environment and sustainability, who leads the Sustainability Without Borders group; John Vandermeer, professor of ecology and evolutionary biology, and environment and sustainability; Arturo Massol of Casa Pueblo; Katia Avilés of Organización Boricuá; Mariangie Ramos, Olgaly Ramos and Javier Lugo of the University of Puerto Rico-Utuado; and Gerson Beauchamp, Lorenzo Saliceti-Piazza and Yanira Sánchez de León of the University of Puerto Rico-Mayaguez. This team will work to develop strategies to establish and evaluate the potential energy output, environmental impact and socioeconomic benefits of a Green Energy Village demonstration project within the Eastern Market District in Detroit. Researchers: Paul Draus, professor of sociology and anthropology at UM-Dearborn; Juliette Roddy, professor of public policy and health policy studies at UM-Dearborn; Joshua Newell, associate professor of environment and sustainability; Kevin (Hua) Bai, associate professor of electrical and computer engineering at UM-Dearborn; Carl Nielbock and Janai Gilmore of CAN Art Handworks; and Dan Carmody and Lydia Rae Levinson of the Eastern Market Corp.